New York, NY – April 6, 2011 – Following a decade of steady declines, a new national study released today by the Partnership for Drug-Free Kids and MetLife Foundation indicates that teen drug and alcohol use is headed in the wrong direction, with marked increases in teen use of marijuana and Ecstasy over the past three years. The 22nd annual Partnership Attitude Tracking Study (PATS), sponsored by MetLife Foundation, affirms a disturbing trend that has emerged among American teens since 2008 and highlights that as underage drinking becomes more normalized among adolescents, parents feel unable to respond to the negative shifts in teen drug and alcohol use. According to the three-year trend confirmed in this year’s 2010 PATS data, there was a significant 67 percent increase in the number of teens who reported using Ecstasy in the past year (from 6 percent in 2008 to 10 percent in 2010). Similarly, past-year marijuana use among teens increased by a disturbing 22 percent (from 32 percent in 2008 to 39 percent in 2010). The new data underscore alarming patterns in early adolescent alcohol use and found that teens view drinking alcohol – even heavy drinking – as less risky than using other substances. 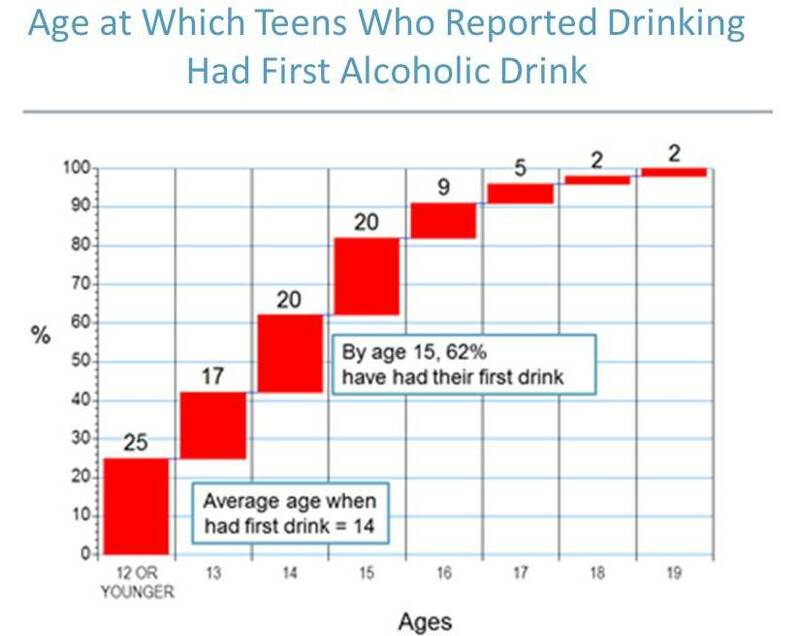 • Of those teens who reported alcohol use, a majority (62 percent) said they had their first full alcoholic drink by age 15, not including sipping or tasting alcohol. • Of those teens who reported alcohol use, one in four (25 percent), said they drank a full alcoholic drink for the first time by age 12 or younger. • Among teens who reported drinking alcohol, the average age of first alcohol use was 14. Weak perceptions of risk and a perceived “normalization” of underage drinking underlie the PATS survey data on adolescent alcohol use. • Almost half of teens (45 percent) reported they do not see a “great risk” in heavy daily drinking. • Only 31 percent of teens strongly disapprove of teens and peers their age getting drunk. • A majority of teens, seven out of 10 (73 percent), report having friends who drink alcohol at least once a week. While the number one reason teens reported using alcohol is that they think “it’s fun to drink” (60 percent), a significant number of teens reported using alcohol to deal with stress. It’s important to note that teens who begin drinking before the age of 15 are much more likely than other teens to develop problems with alcohol as adults. The PATS survey also found that parents feel unprepared to respond to underage drinking by their children. Almost a third of parents (28 percent) feel “there is very little parents can do to prevent their kids from trying alcohol.” One in three teens (32 percent) thinks their parents would be ok if they drank beer once in a while; yet only one in ten parents agrees with teens drinking beer at a party. For parents who suspect or know their child is using drugs or alcohol, the Partnership for Drug-Free Kids created Time To Get Help, a first-of-its-kind website and online community to provide parents of teens and young adults with lifesaving information when families are in crisis and facing a child’s addiction. With teen drug and alcohol use on the rise, the likelihood that more young people will need treatment increases. Of the nine million American teens and young adults needing treatment, two million are between the ages of 12-17, and ninety percent of those are not getting the help they need. Time To Get Help offers parents and caregivers comprehensive insight into adolescent alcohol and drug abuse, dependence and addiction; support from top experts and other parents who have been there; and treatment options for their child and family. According to the PATS survey, teen abuse of prescription (Rx) medicines continues to be an area of major concern, with abuse rates holding steady and at levels that should be worrisome to parents. The data found one in four teens (25 percent) reported taking a prescription drug not prescribed to them by a doctor at least once in their lives, and more than one in five teens (23 percent) used a prescription pain reliever not prescribed to them by a doctor. Teen past-year use of over-the-counter (OTC) cough medicine has remained at roughly one in ten (11 percent). Past-year teen inhalant abuse remains at 10 percent, yet only 60 percent of teens strongly agree that “sniffing or huffing things to get high can kill you,” significantly less than the 70 percent of teens who said the same in 2008. Inhalant abuse merits careful monitoring – as teen attitudes towards inhalant abuse weaken, abuse is more likely to increase. Teen smoking rates have remained stable with 27 percent of teens reporting smoking cigarettes in the past month. Among teens, past-year methamphetamine use is holding at 5 percent and cocaine/crack is at 9 percent. Teen use of heroin use remains low at 4 percent for lifetime use. For more information, or to view the full PATS report and key findings, click here. The 22nd annual national study of 2,544 teens in grades 9-12 and 831 parents is nationally projectable with a +/- 3.6 percent margin of error for the teen sample and +/- 3.4 percent for the parent sample. Conducted for the Partnership for Drug-Free Kids and MetLife Foundation by GfK Roper Public Affairs & Corporate Communications the 2010 PATS teen survey was administered in private, public and parochial schools, while the parent survey was conducted through in-home interviews by deKadt Marketing and Research, Inc.
the Partnership for Drug-Free Kids is a nonprofit organization that helps parents prevent, intervene in and find treatment for drug and alcohol use by their children. Bringing together renowned scientists, parent experts and communications professionals, this public health nonprofit translates current research on teen behavior, parenting, addiction and treatment into easy to understand resources at drugfree.org. The organization also reaches families through its community education programs which focus on local drug and alcohol issues of concern for parents, youth and the Hispanic community. the Partnership for Drug-Free Kids depends on donations from individuals, corporations, foundations and the public sector and is thankful to SAG/AFTRA and the advertising and media industries for their ongoing generosity. For over 20 years, MetLife Foundation has provided support for initiatives focusing on substance abuse prevention and education. Since 1999, the Foundation has collaborated with the Partnership for Drug-Free Kids on a national public awareness campaign to help parents and caregivers communicate with children about the risks of drug use. MetLife Foundation was established in 1976 by MetLife to carry on its long-standing tradition of corporate contributions and community involvement. For more information about the Foundation, visit metlife.org. Center on Addiction and the Child Mind Institute have developed Substance Use + Mental Health in Teens & Young Adults: Your Guide to Recognizing & Addressing Co-occurring Disorders. The Partnership is extending the hours on the Parent Helpline to reach even more families. The Partnership launched a new Vaping Guide, a resource to help parents talk with their kids about the risks of vaping. This is strange to read being a high school student my self. I wasn’t aware of how bad these problems have become. I hope that this problem is not found in my school, a very small school, as bad as this. How can I go about it to site this article? Can I site it as (PATS, 2011)? I want to use some of these statistics for my comps course in my master of science program in school counseling. This is very scary to think about. I wonder if any of the pressures felt by teens is a result of the increase in school testing. Too much focus is spent on reaching benchmarks, and this causes a great deal of pressure for kids.